Some months pass by so quickly, without any milestones or fanfare, that I find myself surprised when I see our mortgage auto-deducted from our checking account. Other months stand up and demand notice. April 2014 is one of the latter. 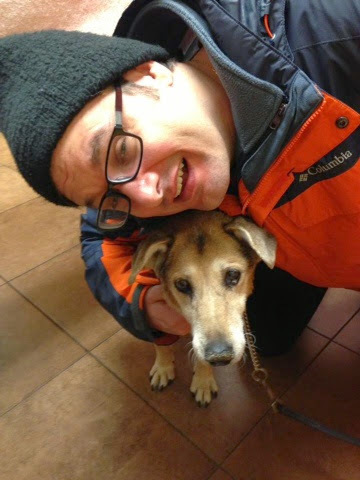 On Wednesday, April 2nd, we said goodbye to Ada, our sixteen-year old wonderdog. 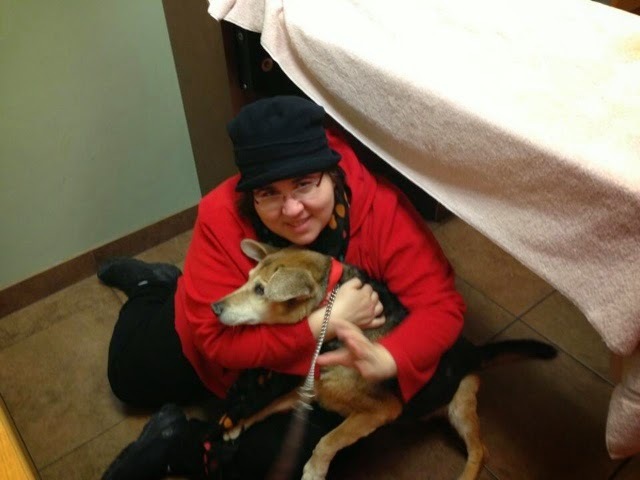 As I noted here, we brought her to the vet clinic the previous Saturday, believing it must be the end, but at that appointment, she was such a show-off for the vets and techs, she looked too sturdy to go. We got more meds. We didn't really want them, as they didn't seem to help much, but we felt too guilty not to take them. We sighed about the outcome. We didn't want her to die, but we didn't want to keep witnessing the downward spiral, either. Were we being selfish or selfless? We couldn't tell—it was some hybrid born out of continual grief-in-process. I chatted on FB with a good friend, asking the question, in all-caps, "WHY WON'T ANYONE KILL THIS DOG?" It was gallows humor, my best attempt at trying to reconcile myself with the hopeless ending on the horizon, and my frustration that everytime we thought that hopeless ending had arrived, we were told to keep looking for signs. 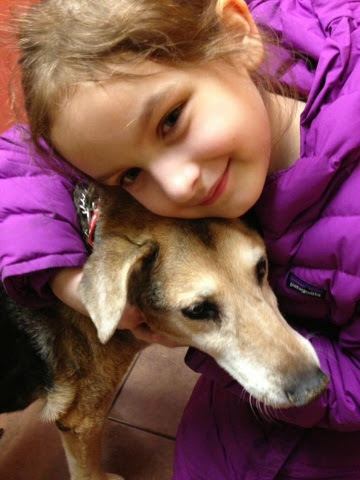 Every vet visit, we prepared ourselves to leave sobbing with an empty leash in hand, and every time, we left with roughly a $100 charge, a container of pills, and a reassurance that our dog was just old, not dying quite yet. Seizures = she's just old. Sneezing blood = old again, with a tumor that wasn't deadly yet. Intestinal upset all over the house = elderly GI systems aren't reliable. Trouble climbing the stairs = old joints. While we kept noticing more and more things, none of them added up, at least in the schematic that was described to us over and over, to equal "the end." So there we were, four days after her last visit, with an old lady dog at her thinnest weight ever, barely eating, except for the teaspoon of peanut butter she got in the morning and evening with her pills, and still experiencing all of the symptoms described above. Calling the vet to schedule another visit would be futile, as there were no new details to report about her wretched state, and the details we had already reported had no new treatments. We didn't know this would be the day. About an hour after EJ left for school, I watched Ada have a seizure in our front hall. It wasn't the worst I'd ever seen, but it was there. She then started walking in a loopy way, pausing occasionally for long stares at nothing at all, as if she could not get her bearings. We'd been watching this for weeks, calling out to her, with no response. I got up and pet her, and she eventually went to her dog bed and rested. When I came back into the room, however, she had gotten sick all over the place, and was still in the act. I grabbed her and brought her down the three flights of stairs, where she just stared at me. Figuring she had nothing left in her system, we started to climb back up, but she could barely make it. I had to lift her up a few times, and carry her part of the way. For the first time, I was grateful for her drastic weight loss. After cleaning up the mess, I sat with her for a little while. She seemed in decent spirits, looking up at me in her thoughtful way. I told her how sorry I was that this was happening. I told her how we couldn't let her suffer much longer, no matter how sweetly she looked up at us, or how spry she appeared at the vet's office. About an hour later, she was sick again, and down the stairs we flew, with the same result. During our second climb, I whispered into her ear as I carried her, "Ada, you will never have to climb these stairs again, I promise." Once we were up, and she was settled, and the rug and floors were cleaned again, I told Mike, "This is the day. We are done. She is suffering, I don't care what [the vets] say, I don't care that she isn't giving us 'the look' that everyone said she would give. She is a good dog who wants to please us and we cannot let this continue." He seemed so relieved, and expressed a similar sentiment. The vet had told us, "When you know, call us or just come in, don't hesitate." I understood why—looking at Ada sleeping on her bed, I could almost forget the past three hours of anguish, the past three weeks of weight loss, the past three months of steep decline. I made a call that was different from all the others; I didn't ask if we could see the vet, I just said, through choking sobs that took over suddenly, "I think it is time that we put our dog to sleep." I'm crying now just thinking about it. 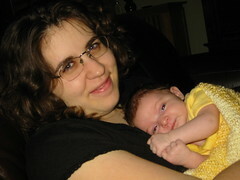 We waited until the evening, when our kiddo was home to say goodbye. She wanted to go to the vet's office with us. We took EJ to ballet class, as she thought it might make her feel better, told the teacher that she may have a hard time, and Mike and I counted the minutes until we picked up our dog for her last car trip. Once we were all loaded up and on our way, we heard a gasp from the backseat of the car—we thought EJ was panicking, but really, she had just lost another baby tooth, a loose canine that had been on the verge of coming out for days. We used the tissues we brought for our tears to wipe up her bloody mouth. The whole night felt odd, as if momentous occasions were haphazardly slapped onto the regular Wednesday afterschool schedule. At the clinic, because Ada was not already lying down and infirmed, the vet suggested it may be harder to get her resting for the shot if all of us were in the room. I think, honestly, he was worried about our kid. Mike volunteered to stay. The vet left the room temporarily for us to say good-bye. As we were giving our last hugs, Mike asked me if I would take a photo of him with Ada. I hadn't planned on taking any shots of the last moments, as I thought it might feel morbid, but I'm glad he asked now, as we all took some. The photos aren't the prettiest or the happiest, but when I look at them, I can still feel that hug, the softness and spikiness of her (always weird) fur, the bones I could feel through her skin, telling me we were doing the right thing. I also have a moment of genuine devotion between my daughter and her first pet to always remind me what a gift Ada was to our whole family. In the lobby, EJ cried for awhile. I cried for awhile. Had she wanted to stay in the room, we would have insisted, but she seemed relieved that her dad was taking care of this, and she could just be in the lobby to weep and be held. The techs gave her a tiny baggy for her newly-lost tooth. She said thank you, wiped her tears, then focused her attention on a wall of photos of pets and their owners, vets with the pets, etc. She started to smile at the cuteness. Ten minutes later, Mike came out, followed by the vet. 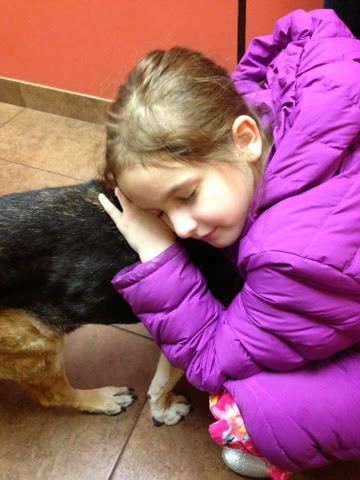 We all gave each other hugs, the vet included—you could tell it was hard on him, too, as he loved our old girl. It was done. In the end, there was no sign from our dog, and I am grateful to all those friends out there who called, emailed, and posted messages to me via social networking who expressed variations of, "your pet may not give you a sign." Our own judgement made the call, and I know it was right. I actually wished we'd done it sooner the moment it was done, knowing how long that poor dog had kept going, likely in pain, definitely in discomfort. We went out for hamburgers at Five Guys on our way home. EJ was relieved that she could chew again without her loose tooth. While eating, we got calls from family and friends who had seen our messages about Ada. A family friend who we hadn't seen in a long time came in, and made us smile, saying, "The only cure for this is getting another dog, you know!" EJ entertained the toddler at the table next to us, playing peek-a-boo and dancing around between the tables to make her giggle. Everything happening felt very alive, and I could feel myself starting to remember the younger, livelier Ada, the Ada we hadn't seen in years. It made me cry and smile at the same time. Within a matter of days, our realtor was at our house with a professional photographer, taking photos of our place for our online listing, and our condo was on the market. In the photos, there is little evidence that a dog ever lived there—let's face it, in perfectly neat/staged photos, there is almost no evidence that anyone lives there—although we did keep her leash hook up in our pantry, for no other reason than to make us smile. Since Ada passed away, we have had showings at our house, as well as open houses (one is going on at our place as I type this at a café a few blocks away.) While Ada was the friendliest dog we'd ever met with people, and likely would have been energized by strangers visiting, I cannot imagine a scenario in which she could have been able to handle this without disruption. Selfishly, I'm grateful that we don't have to worry about the messes she was making regularly at the end of her life, and that we don't have to find places for her to hang out during showings. Practically and emotionally, physically and spiritually, her time was the right time. Now, as April wraps up, we hope for a buyer for our condo. We hope for a new beginning soon. We hope for excitement and adventure and comfort and setting down roots, all at once. There will be no new dog for awhile, but once we know more about where we will be, there will be another. There will always be Miss Ada, though, named after Ada Lovelace (a genius one-of-a-kind gal, whose ideas and discoveries out-lasted her short time on earth), right there in the foundation of it all, forever after. That is a perfectly appropriate question. You'd imagine we'd have a quick answer. I'd love it if we knew, really. In reality, we have narrowed down our options to three areas. We have investigated them, done home searches (or are doing home searches), and have contacted friends in each area. Since Mike can live anywhere for his job—thank you, fantastic distributed company—we are focusing our location investigation on my job prospects. We are figuring it out. If you want to know why determining big things, like where to put down roots, are so daunting for our little family of three, here's an everyday example that just happened—I'm typing this with my wet hair wrapped in a towel. The hubby and kiddo: Making lunch. Kiddo: (Yelling) Mom! Mom! Can we (indistinguishable garble)...salad? Me: (Stepping out of shower, concerned): What is going on? Hubby: (Outside door) Forget it, can I just come into the bathroom to talk to you? Me: Yes, what is going on?? Hubby: (Stepping inside, letting all the steamy, warm air out) Can we open the new box of salad? Hubby: We have a half-opened container of spinach leaves, so can we open the new box of salad greens, or can we only have the spinach that is open? Me: Open the salad greens. Why are you asking me this? Was this a necessary crisis to have me called out of the shower? Hubby smiles, shuts door, leaves. I've joked with my husband many times that his last name is actually French for, "let's think this through just a little longer," while my maiden name in Italian is, "let's get going already." I promise we'll figure out where we are living very, very soon. We are almost there. It is painfully slow for me, so no need to ask. It feels like lightning speed to the hubs, who suggested just this morning that "we really should do more research." That's the beauty of selling the house, though: we must move, so we will. In the meantime, spinach and lettuce are open and available for lunch here at our house. Stop on by!